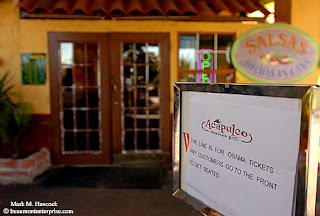 Only a sign remains at Acapulco Mexican Grill minutes after all Obama town hall meeting tickets were distributed at the restaurant in Beaumont on Wednesday, Feb. 27, 2008. Obamania has hit Beaumont and all the free tickets to his speaking event were snatched up within minutes at all distribution points. Although out of tickets for the Obama town hall meeting, the campaign's local headquarters remains a beehive of activity in Beaumont. Obama's Jefferson County headquarters has sold out of T-shirts and everything else Obamese. 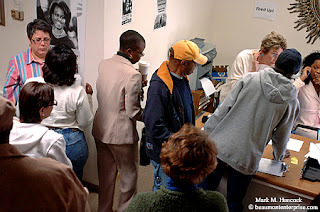 Please read, "Obama tickets create frenzy..." by Dee Dixon. 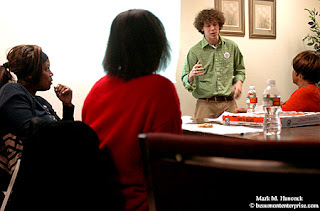 Jack Jenkins (standing) conducts a training session with (from left to right) Alberta Jackson, Patricia Smith and Geraldine Wilson at the Obama campaign headquarters in Beaumont on Tuesday, Feb. 26, 2008. 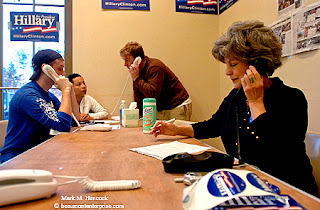 Garrett Dee, Ivy Pratt, Paul Andrews and Rose Cormier man a phone bank at the Clinton campaign headquarters in Beaumont. Both campaigns are trying to mobilize the base to caucus on election day. Unlike any previous year, the Texas primary may determine the Democratic nominee. Please read, "Barack will take nomination fight to Julie Rogers Theatre; could Hillary be far behind?" by Dee Dixon. 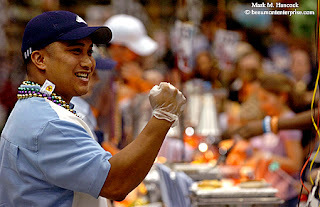 Hausman Foods regional account manager Josh Acut celebrates getting another happy customer during the 8th Annual Food Show and Tasting at the Beaumont Civic Center on Tuesday, Feb. 19, 2008. About 700 Southeast Texas students, parents, teachers and school administrators were invited to sample foods intended for school consumption. 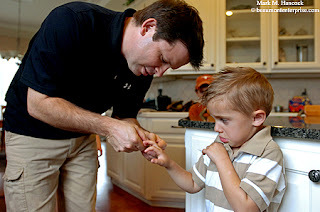 Clint Brasher (left) trims the fingernails of his son Adam, 3, (right) in the family's home in Orange County north of Vidor on Saturday, Feb. 16, 2008. 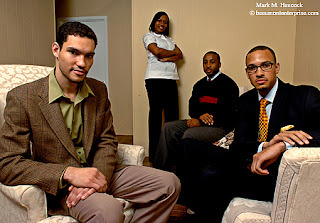 Women report they are attracted to men who help around the house in non-traditional roles such as childcare. 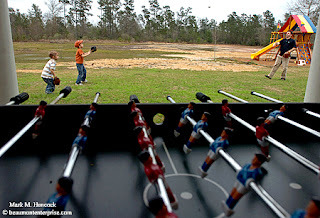 Clint Brasher (right) tosses a baseball to his sons Adam, 3, (left) and Derek, 6, (center) in the family's yard in Orange County. The help given by husbands allows women time to relax and unwind. 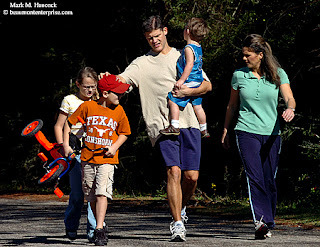 Jon Healy (center) takes a Sunday morning walk with his family in Orange County north of Vidor on Sunday, Feb. 17, 2008. Family members include (from left to right) Jessica, 10; Garrett, 7; Branson, 2, and his wife Priscilla. For many women, this extra time provided through so-called "choreplay" equates to a romantic prologue. Please read, "Choreplay: Want to turn on your woman?" by Helena Oliviero / Cox News Service. Ozen's Breon Johnson (No. 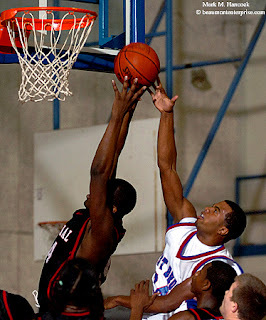 11, left) tries to take a rebound away from Central's Gavin Donald (No. 32, right) at Ozen High School in Beaumont on Tuesday, Feb. 5, 2008. Rain falls on the Wimberly Building at Lamar University in Beaumont on Tuesday, Feb. 12, 2008. Picketers positioned themselves outside the building in 1956 to protest the school's integration. 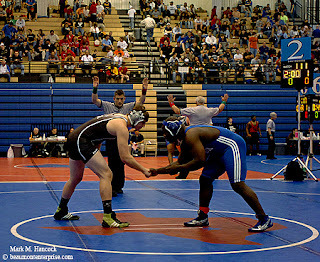 Today is the final day of the Texas State Wrestling Championships in Austin. I'll post some images today as I get time, but it's likely to be very hectic. Chris Dabe will be blogging live again today. Moulton won his first match by pin in 1:45. 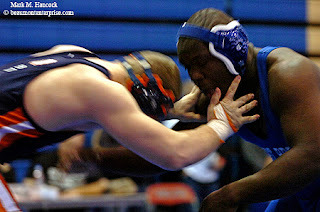 He lost his second match and was knocked out of the gold and silver. He moved into the consolation bracket with a chance at the bronze. However, he must win all four remaining matches. Friday evening, he won his first consolation bracket match by pin in 0:30. If he loses this morning, he's out. If he wins, he moves into the afternoon session. If he wins the afternoon session, he moves into the night competition for the bronze medal. 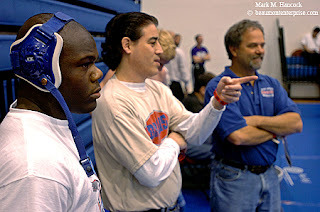 Gerald Moulton (from left to right) as well as coaches Greg Diaz and Phil Hemmings watch as the opponent who defeated Moulton Friday loses a Texas State Wresting Championship semifinal match at the Delco Activity Center in Austin on Saturday, Feb. 23, 2008. Moulton is still in the running for 3rd place. Marcus McGraw of Arlington Bowie (bottom) gets pinned in triple-overtime by David Ortega of Katy Taylor (top) during a Texas State Wresting Championship semifinal match at the Delco Activity Center. This drops McGraw into the consolation bracket, and Moulton could wrestle him in the third-place match. Gerald Moulton wrestles Matt Parker of Paschal during a Texas State Wresting Championship colsolation match at the Delco Activity Center. Gerald Moulton wrestles Matt Parker of Paschal during a Texas State Wresting Championship colsolation match at the Delco Activity Center. Moulton won the match and advances. Nancy (left) and Lupe Flores (right) talk with Gerald Moulton after one of his wins in a Texas State Wresting Championship colsolation match at the Delco Activity Center. Moulton is still in the running for 3rd place, but must defeat one more opponent to take the bronze. 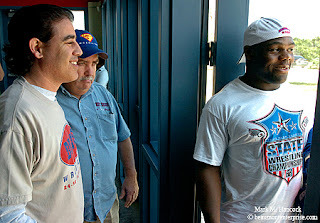 Club coach Greg Diaz (from left to right), Lupe Flores and Gerald Moulton leave for lunch after a Texas State Wresting Championship colsolation match win at the Delco Activity Center in Austin on Saturday, Feb. 23, 2008. Moulton is still in the running for 3rd place, but must defeat one more opponent to take the bronze. 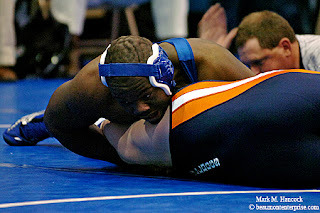 Gerald Moulton (top) wrestles with Zach Gagnon of McKinney North (bottom) during a Texas State Wresting Championship colsolation bracket match at the Delco Activity Center in Austin on Saturday, Feb. 23, 2008. Gerald Moulton (right) wrestles with Zach Gagnon of McKinney North (left) during a Texas State Wresting Championship colsolation bracket match at the Delco Activity Center. 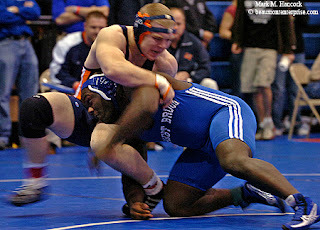 Gerald Moulton (right) takes down Zach Gagnon of McKinney North (left) during a Texas State Wresting Championship colsolation bracket match. Gerald Moulton (top) pins Zach Gagnon of McKinney North (bottom) during a Texas State Wresting Championship colsolation bracket match. Moulton won the match by pin at 2:34 and advances. 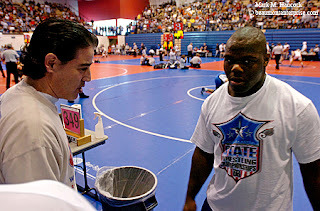 Gerald Moulton (right) talks with club wrestling coach Greg Diaz (left) after winning his morning consolation bracket match during a Texas State Wresting Championships. Moulton is still in the running for 3rd place, but must defeat two more opponents to take the bronze. We are blogging live from Austin today. I'll be photoblogging as I get time. Chris Dabe is text blogging live throughout the day. Please read the story about West Brook High School senior Gerald Moulton to understand the significance of his achievements. 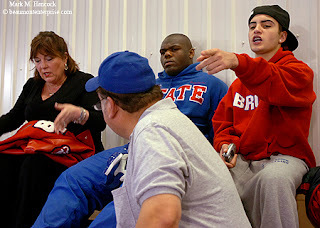 Gerald Moulton arrives for weigh-in before the Texas State Wresting Championship at the LBJ High School in Austin on Friday, Feb. 22, 2008. 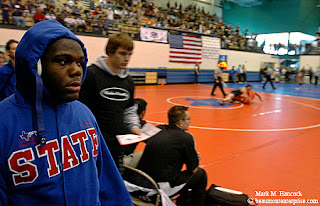 Gerald Moulton waits alone for weigh-in before the Texas State Wresting Championship at the LBJ High School in Austin. 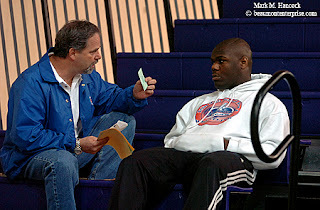 Wrestling coach Phil Hemmings (left) talks with Gerald Moulton (right) before weigh-in for the Texas State Wresting Championship at the LBJ High School. 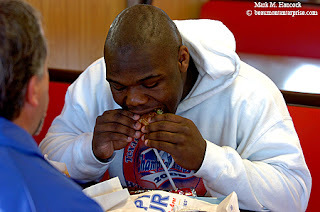 Gerald Moulton (right) finishes off a burger with wrestling coach Phil Hemmings (left) at a Sonic restaurant following weigh-in in Austin. 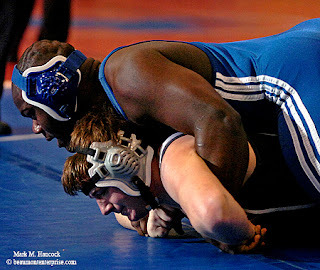 The West Brook High School senior faces his first day of competition in the state wresting championships. 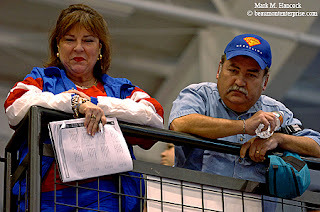 Gerald Moulton (center) is surrounded by family members including (from left to right) Nancy Flores, Lupe Flores and Andy Flores during the Texas State Wresting Championship at the Delco Activity Center. Gerald Moulton (top, center) has a laugh with his house mother Nancy Flores (left) as his house father Lupe Flores (right) checks text messages before Moulton's first match in the Texas State Wresting Championship at the Delco Activity Center. Gerald Moulton (left) enters the mat area at the Delco Activity Center in Austin for his first match in the Texas State Wresting Championship. Gerald Moulton (top) shakes hands with Jimmy Allen of Canyon Randall before his first match in the Texas State Wresting Championship at the Delco Activity Center. Moulton won the match with a pin at 1:45. Gerald Moulton (top) works Jimmy Allen of Canyon Randall into position during his first match in the Texas State Wresting Championship at the Delco Activity Center. Moulton won the match with a pin in 1:45. Former President Bill Clinton stumps for his wife Hillary in Beaumont, Texas. He also explains a little-known-fact about the Democratic caucus system in Texas, which allows Texas voters to legally vote twice. Please also see Hillary Clinton's speech and Barack Obama's speech. 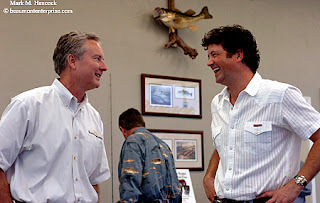 Mike Hebert, president of Texas Marine, (left) shares a laugh with Country and Western singing legend Tracy Byrd (right) at the boat dealership in Beaumont on Saturday, Feb. 16, 2008. Byrd was at the dealership to promote the upcoming Beaumont Boys Bash annual Big Bass Tournament. The tournament benefits several area charities. This year has been insanely busy. This week should pump up the volume more. So, I don't have time to make PJ questions this week. I'll make up for the posts when I get time. There will still be 366 Qs (it's a leap year) by Dec. 31. Meanwhile, on Friday and possibly Saturday, I'll be photoblogging live as part of a project with the newspaper. For folks who come here via Google Reader, Bloglines, Netvibes or similar notification, this blog will be overly active for a day or two this week. Gerardo Escobar (played by Chris Eldredge, left) threatens Dr. Roberto Miranda (played by Andy Coughlan, right) with a knife during a rehearsal for "Death and the Maiden" at The Art Studio in Beaumont on Tuesday, Feb. 12, 2008. Gerardo Escobar (played by Chris Eldredge, top) threatens Dr. Roberto Miranda (played by Andy Coughlan, bottom) with a knife during a Take A Bow rehearsal at The Art Studio. Paulina Salis Escobar (played by Joanna Clark, left) threatens to kill Dr. Roberto Miranda (played by Andy Coughlan, right) remains tied to a chair during a Take A Bow rehearsal for "Death and the Maiden" at The Art Studio in Beaumont. The U.S. government can close a U.S. newspaper only if it does what? 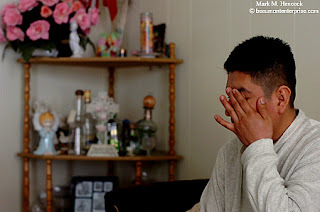 Dario Pluma-Morales wipes his eye as he talks about his brother at his Beaumont home on Friday, Feb. 15, 2008. Crescenciano Pluma-Morales, Dario's brother, was killed by a hit-and-run driver while he rode his bicycle in Beaumont Saturday, Feb. 9, 2008. 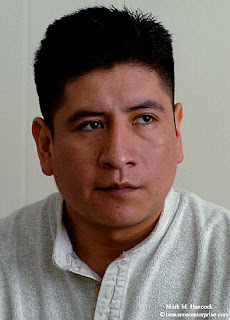 Dario Pluma-Morales talks about his brother at his Beaumont home. Police have identified the woman who killed Crescenciano and fled the scene. 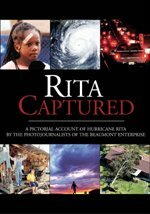 She is free until a grand jury decides if she will face charges. 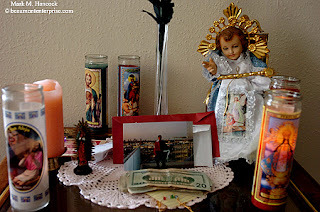 An altar in honor of Crescenciano Pluma-Morales remains at the Beaumont home of his brother, Dario Pluma-Morales. Dario arranged to have the body of his brother transported to Chiautempan, Mexico. He'll be buried near his mother in his hometown cemetery. Many immigrants are buried in unmarked graves annually when the state can't locate the next of kin. Police would like everyone to add a contact number to their personal cell phone contact list and label it "ICE." ICE stands for "In Case of Emergency." Police can call this number to notify family members if the cell phone owner is injured or killed and isn't carrying identification, which is common following robberies. Please read, "Unlike many immigrants..." by Rose Ybarra. Who is considered "press" or "media" in America? 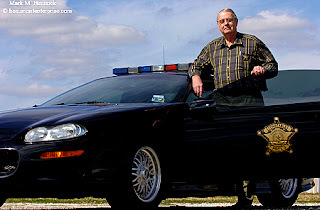 Orange County Precinct 3 constable John A. Ford poses for a portrait near his office in Orange on Thursday, Feb. 14, 2008. Ford will have served 38 years at the end of his term making him the longest-serving elected official in Orange County's history. 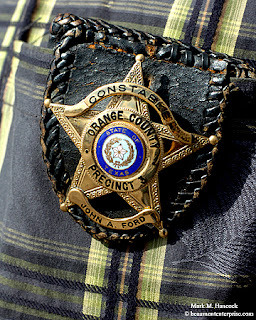 Orange County Precinct 3 constable John A. Ford's badge shows some wear and tear near his office in Orange. He took the job after his brother, Louis Ford, Jr., was killed in the line of duty in Bridge City in 1971. 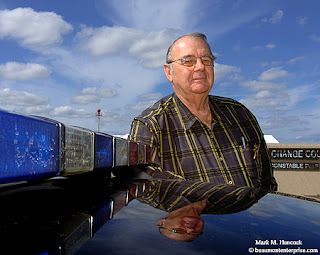 Orange County Precinct 3 constable John A. Ford poses for a portrait near his office in Orange. Sixteen candidates are competing in the primary races for the four county constable positions. Only one precinct has an incumbent. In the wide-open race for Precinct 3, three candidates hope to take Ford's spot. Please read, "16 hopefuls pack ballot..." by Robert Hankins. Why would PJs make more than one portrait of a single subject? Treasures From The Heart floral design and gift store in Pineland is the epicenter of a pre-Valentine's Day rush on Wednesday, Feb. 13, 2008. 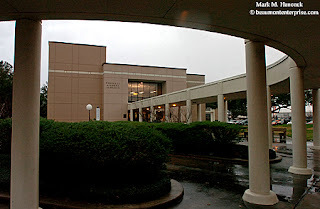 The building has been home for many businesses over the years including churches, a clothing store, an auto parts store, a mortuary and its current incarnation as a floral design and gift store. People in the images include: Truitta Short, Rachael Foster, Mandy Hardy, Erica Barlow, constable Jerry Dan Webb and Buel Puryear with Roderick of Texas Floral of Lufkin. Originally linked to, "Florist occupies Pineland building..." by Jemimah Noonoo. Are elected officials or PJs subjected to the most thorough background checks? Rusti Girolamo, owner of Rusti's Shoe Box, poses for a portrait with some of the donated shoes at her store in Beaumont on Tuesday, Feb. 12, 2008. Girolamo is participating in the Soles 4 Souls shoe drive through Feb. 29. The drive provides shoes for people around the world who have lost everything due to natural disaster or other circumstances. All kinds of shoes are needed and accepted. Please read, "Beaumont store taking shoe donations..." by Heather Nolan. How does the Fairness Doctrine and Section 315 of the Communications Act of 1937 apply to a PJ's coverage of elections? 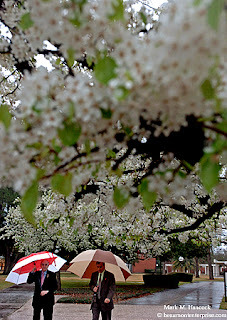 Jack Hopper, Lamar University dean of engineering, (left) and associate dean Victor Zaloom (right) walk through the rain by the Cherry Engineering Building at the university in Beaumont on Tuesday, Feb. 12, 2008. Tuesday's cold front brought severe thunderstorms and a temperature drop from recent unseasonably warm weather. What should PJs do before dramatic weather changes? The children of local leaders are following in their parents' footsteps in Beaumont on Wednesday, Feb. 6, 2008. Future leaders (from left to right) are W. Joe Deshotel, son of state Rep. Joe Deshotel; Lindsey Williams, daughter of BISD secretary Terry B. Williams; Lance Bean, son of NAACP activist Sam Bean; and Sean Samuel, son of Beaumont mayor pro-tem Audwin Samuel. When it comes to PJ, what is the primary concern of a publisher or assignment editor? Lewis James Hodge of Beaumont (left) and Allen J. Scott, Sr. of Silsbee (right) remember Santa Fe workers in a photo at the Ice House Museum and Cultural Center in Silsbee on Saturday, Feb. 9, 2008. 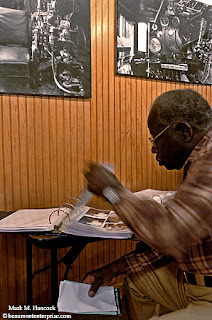 Richard Hawkins of Silsbee looks through a photo album at the Ice House Museum and Cultural Center. 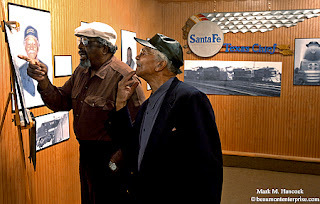 The museum is currently hosting an exhibit of black employees of the Santa Fe Railroad. 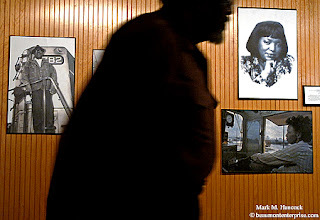 A guest passes a photo display at the Ice House Museum and Cultural Center in Silsbee on Saturday, Feb. 9, 2008. The display includes Ollie R. Holmes, the first woman engineer (right). What should be the first shots taken at any sporting event? West Brook's Donte Lopez (No. 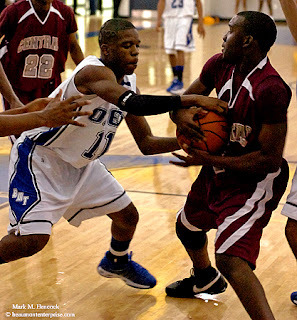 11, left) drives the ball into play past Port Arthur Memorial's Shaquille White (No. 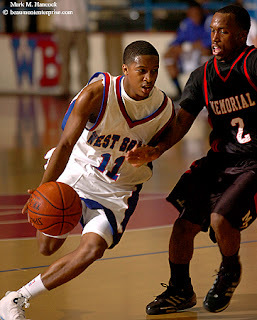 2, right) during a basketball game at West Brook High School in Beaumont on Friday, Feb. 8, 2008. West Brook's Marcus Malbrough (34, right) gets a piece of the ball before Memorial's Justin Reno (44, left) can take it to the hoop during a basketball game at West Brook High School. West Brook's William Chu (No. 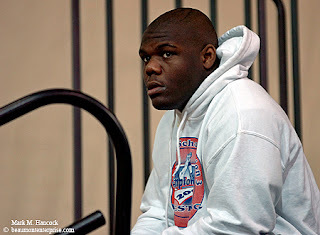 1, left) and Memorial's JeKore Tyler (No. 10, right) tumble to the floor after an off-balance run at West Brook High School in Beaumont. West Brook won the game 42-38 and advances into the playoffs. West Brook remains in a three-way tie for first place with Humble and Kingwood. Memorial remains tied for fourth. Before charging off to breaking news, what should a PJ do? Lumberton fire marshal Jim Philp investigates following a 24-acre fire in a wooded area of Lumberton off Wheeler Road in Lumberton on Friday, Feb. 8, 2008. 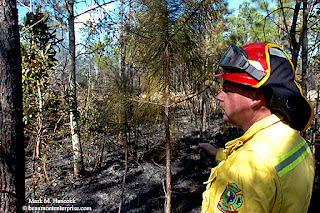 Philp said lack of humidity has dried out vegetation and increased the likelihood of fires spreading rapidly. 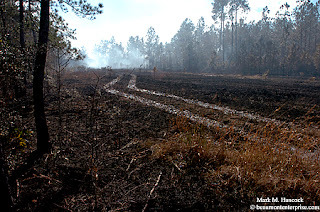 Smoke drifts down a burned path following a multi-acre fire in a wooded area of Lumberton. 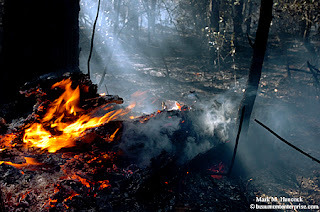 High winds allowed the fire to spread rapidly. A stump continues to burn as Lumberton fire officials investigate the cause of a multi-acre fire in a wooded area of Lumberton. No structures were damaged in the fire. Please read "Lumberton firefighters believe 3-alarm fire might remain mystery" by Julie Shehane.